Today is the yartzeit of Eli Hakohen. When Chana, the mother of the Prophet Shmuel, was praying in the Beis Hamikdash to have children, she prayed with such intensity causing Eli, the High Priest, to wonder about her character, checking the Urim Vitumim (the Divine Name in the breastplate caused the letters to illuminate) he was shown the letters, Shin, Chuf, Resh, and Hey, Eli understood this to mean that she was a "ShiKuRA" (drunk), and he confronted her and chastised her as such, Chana replied with great humility, that this was not the case God forbid, rather she was "KiShaiRA" (kosher - proper), showing Eli a propitious way of permutating the letters (this is an explanation given by the Vilna Gaon). From here we see how what Rabbainu stressed over and over again, that one should always be looking to see the good. Today is also the yartzeit of the Rif, one of the commentaries specifically recommended by Rabbainu Na Nach Nachma Nachman MeUman, that one should desire and aspire to learn in completion every year (Sichos Huran 76). In Chasidic lure it is known that certain hasidim would read the Rif with great diligence thus meriting to be visited and to be taught by the Rif himself as they read his holy commentary. IT SHOULD BE NOTED THAT TODAY - in the scheme of the Counting of the Omer - IS "NETZACH of NETZACH" - the sefira associated to our master - Na Nach Nachma Nachman MeUman! 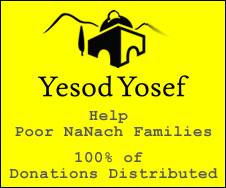 Being that the Rif's Yarhzeit is on the Sephira date of Netzach She'B'Netzach which is associated with Rabbeinu whose name Na Nach Nachma Nachman MeUman is the Shir HaGeula, I thought that the following link pertaining to the Rif and the Geula would be most interesting: http://yeranenyaakov.blogspot.com/2012/05/rifs-1000th-birthday-soon.html. Enjoy! surely the tzaddik is on the level of keter, not netzach.